Photo courtesy of Sandra Bland. Edward Fred Blanchard was a popular early spur maker in the southwestern part of the United States. He was born near Magdalena, New Mexico on September 26, 1894. Blanchard was a true cowboy spur maker. 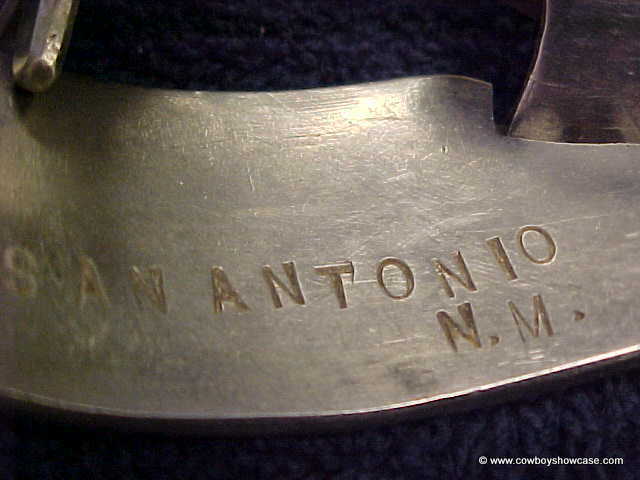 He worked on various ranches in New Mexico and made bits and spurs as a side line. From 1940-1948, Blanchard was in Datil, New Mexico during the summer months, working for the Forest Service as a fire lookout. He worked in Monticello, New Mexico during the winters of those years as a cowboy. Many of his spurs made after the mid 1940s were marked with the town and state of manufacture. San Antonio, N. M. is one such mark. Datil, N.M. and Monticello N. M. are others. The New Mexico marked spurs are very collectable. 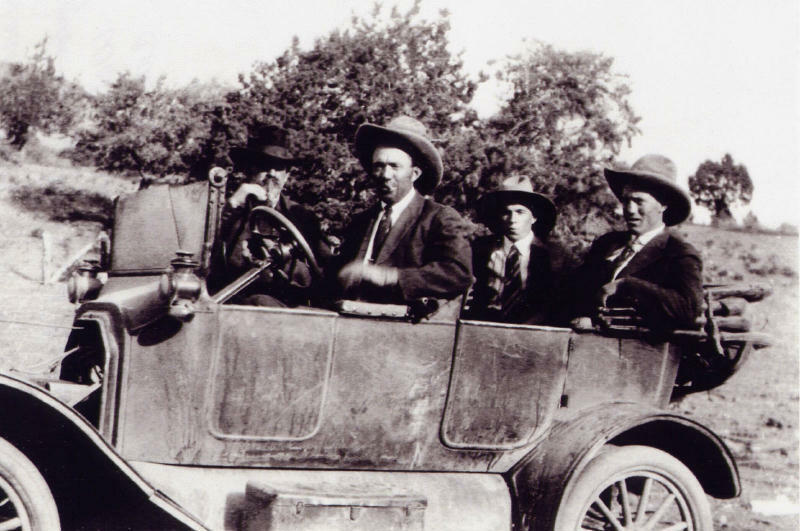 E.F. Blanchard is shown in the photo above in a vehicle with friends. He is seated on the far right. Blanchard moved to Arizona in 1952. He went to work for the Boquias Cattle Company in northwestern Arizona as a ranch cook. 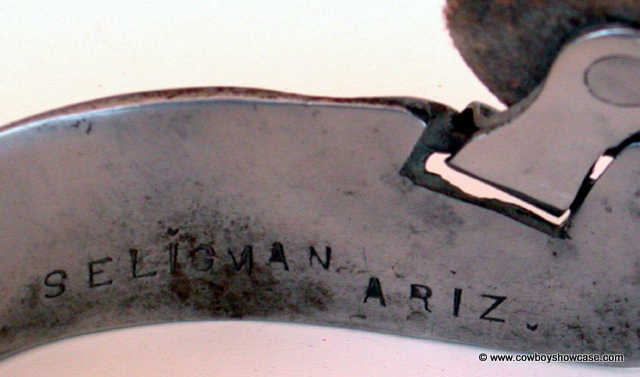 During that time he made spurs with the Seligman, Arizona	mark. Because of the short time he was in Seligman, there are not many spurs with this mark. Blanchard moved to Yucca, Arizona area in 1953. He bought a 20-section ranch 45 miles southeast of there on the Bill Williams River. 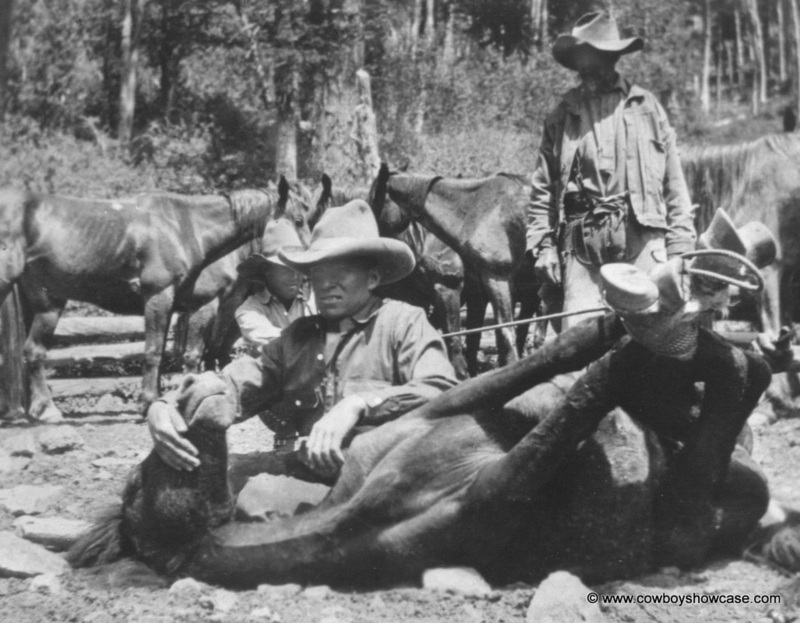 Later, around 1959, he sold his ranch, moved closer to town, and became strictly a spur maker. 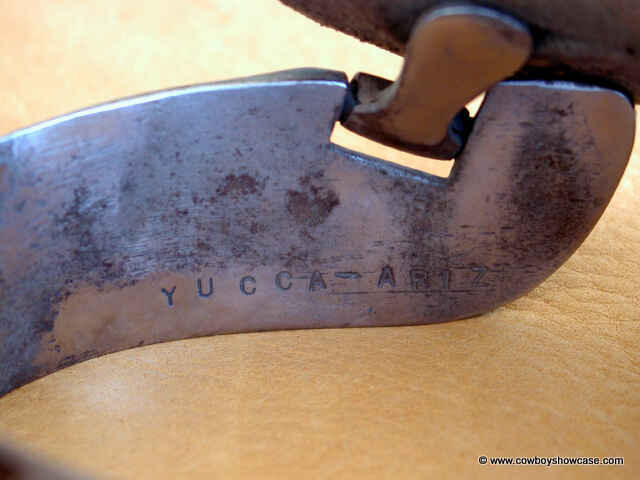 He made most of his spurs while he lived in Yucca, Arizona. It is said he could make a pair of spurs a day. He told a journalist in 1962 that he made 350 pairs a year. The spurs are usually marked inside the heel band with one of six style numbers...2,3,4,5,6,8 and PS for plain steel, SS for stainless steel, or TS for tempered (or tool) steel and E.F. BLANCHARD YUCCA ARIZ (or other place name) in all capital letters. Since all Blanchard's spurs were hand crafted, some stamping differences and errors were made. Apparently, many of his early spurs were unmarked. Custom-made spurs were sometimes marked differently, often without style numbers, and many have silver or brass overlay decoration in the form of designs or brands. During Blanchard's time in Arizona, he marked spurs with the state abbreviations ARIZ and AZ. The AZ markings can be dated as being made after 1963, the year the United States Post Office instituted two letter state abbreviations to go with the new zip code system. Porter's Saddle Company of Phoenix, Arizona carried Blanchard spurs in their store. Walls Pharmaceutical Company gave the spurs as premiums to medicine buyers in the state's cattle feedlots. 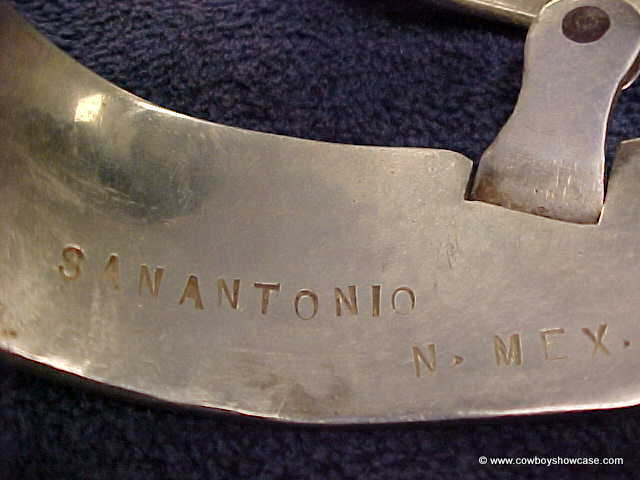 Blanchard's spurs were popular in Arizona, New Mexico, and southern California. Some also made their way into southern Colorado and to Texas and Montana. The spurs are expertly crafted and today's working cowboys still really like the way the spur fits a boot. Blanchard's work evolved over time from forged one-piece spurs to welded, polished spurs. He also made spurs using stainless steel beginning around 1946. Stainless steel is an extremely difficult metal to work with. 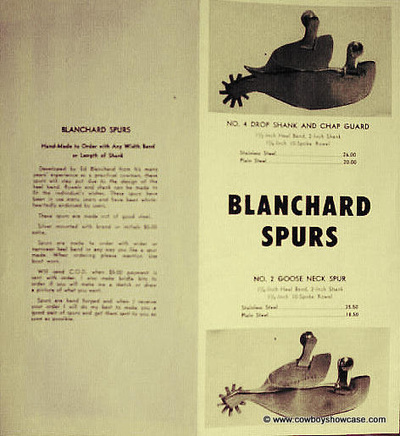 Blanchard produced high-quality stainless steel spurs using an acetylene torch. One unique feature of most of Blanchard's spurs is the angled swinging style of the button. Short shanks and wide heel bands are also a definite mark of Blanchard's style. His design eliminated the need for "tie-downs" to keep the spurs in place. The number-four style is the only one that has chap guards. Blanchard continued to make spurs into his 80s and died in Kingman, Arizona on January 17, 1982. 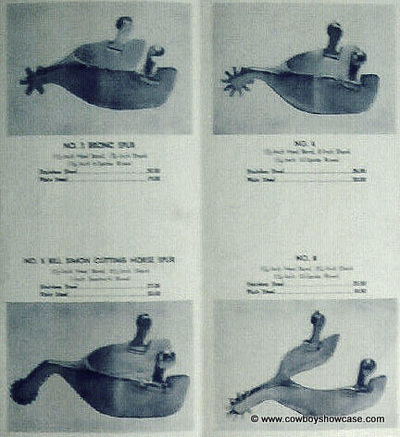 Porter's saddle company of Phoenix, Arizona carried Blanchard's spurs and published a brochure listing the spurs by style number. No. 6 and No. 8 had no other description. Stumbled upon your site while surfing the net and I had no idea Ed Blanchard was so collectible. I spent long hours watching Ed bend the metal and work the torch and then watching my Grandpa put the final touches on the spurs. My story is that I'm the grandson of Daniel Todor (the Yucca Mission Minister) who worked side-by-side with Ed for years in Yucca. I usually spent a good part of my summers (59-65) growing up with my grandparents Dan and Grace who lived in Yucca until around 1985. 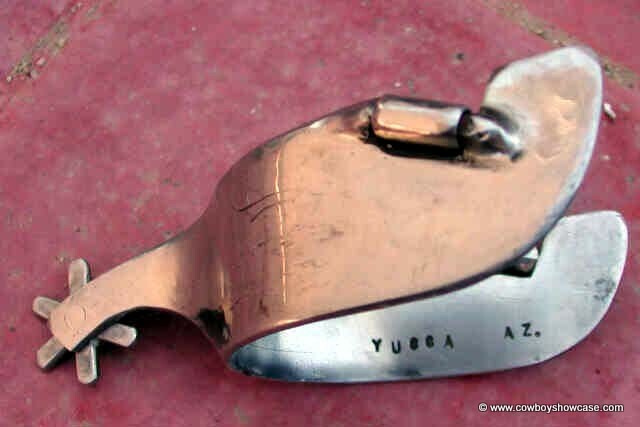 I spent many an hour in Ed's little work shop just behind his house in Yucca watching the two of them craft the spurs that have become as I now know, quite collectible. Grandpa would get the raw finished spur minus the rowel and put the spurs through the paces of the buffing process which would give the spur it's shiny patina and then Ed would add the rowel to finish off the spur. The rowels were buffed separately so to get them completely polished before mounting them to the shank and inserting the holding pin. I remember a few rowels getting away from my Grandpa and rolling along the floor or sometimes impaling themselves into the wood like a throwing star from being buffed. Once the final assembly was done by mounting the rowels, he then put the spurs through the final buffing process to match the overall sheen. One day Ed even had me stamp some of his spurs with his letter set and of course, my Grandpa let me try my hand at buffing too, needless to say, he fixed any spot that I had worked. Being a young kid this was pretty impressive to me and who knows, perhaps some of those spurs are still out there. I remember that Ed would place the spurs in a row on a wood board that was nailed to the studs of the shop for Grandpa to buff and when he finished buffing the spur, he then placed it on the other side of the buffer in a similar arrangement for Ed to mount the rowel and put it back in line for the final pass at the buffer before packaging. The spurs would stack up as Ed would be crafting new pairs while Grandpa was buffing and by the end of the week, they had a shipment ready for delivery. As for further details, not much to add, as the saying goes, same job different day. The only thing that I could add would be that my Grandfather was the Pastor/Minister for the Yucca Mission located down next to the Post Office south of the train tracks and the big wash. He held numerous side jobs mostly handyman as he was the old type jack of all trades master of none. During WWII he worked for Consolidated Aircraft in San Diego as a machinist building aircraft then when he felt the itch he left that job and was a rock-hound collecting stones that he fashioned into jewelry, mostly Bolo Ties, Women's Necklaces/Earrings, and Belt Buckles. Did some prospecting and road construction worked for a young McCullough (chainsaw fame) at "Site Six" which is now known as Lake Havasu, then as the custodian for the Yucca Elementary School District (one schoolhouse, Yucca wasn't that large but provided the elementary for the Kingman High School) then he hooked up with Ed in 1959/60. He became the Pastor of the "Yucca Mission" in 1960 and he and his wife Grace (my grandmother) were the center of Yucca's religious circle as Yucca only had the one church. My Granddad worked side by side with Ed for over 10 years before he felt the itch again and moved on and worked for Lake Havasu Estates as their handyman until about 1983 before retiring completely about two years before they moved to my mom's place in Ramona, CA. in 1986. He passed on due to a heart attack on July 7, 1996 aged 84. Hope you've enjoyed my little passage in time." For more information go to these pages: Blanchard Spurs - How to tell an authentic pair.